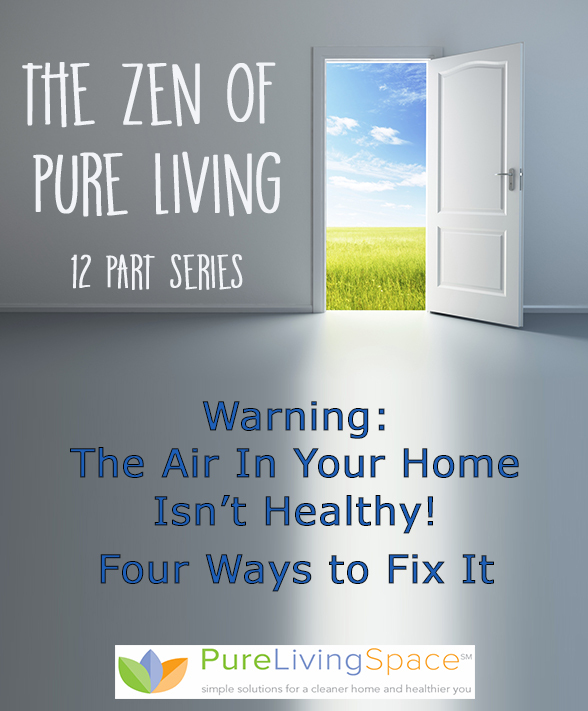 In Part 2 of the series, you learned that indoor air is generally dirtier and less healthy than outdoor air. Although initially, you might have been incredulous, you must admit that the facts about poor indoor air quality are glaringly clear. After all, air is trapped within your home, and so many of your home products and activities add to the mess like air fresheners and cleaning products. By now, you’ve probably cut back on air fresheners and switched cleaning products. Or, at least you are seriously considering it, right? In this part of the series, you will learn four ways to clean up your indoor air. Some are so simple. One or two may surprise you. Simply open your windows to improve the quality of your indoor air. Since you know that the indoor air is actually dirtier than outdoor air, airing out your house will go a long way toward improving what you breathe indoors. The next one may surprise you. That’s right. You’ll want to load up on indoor plants. But not just any plants. You’ll want the ones that are scientifically proven to absorb VOCs. Dr. Bill Wolverton who is an Environmental Scientist and wrote “Plants: Why You Can’t Live Without Them” explains the science and studies that support using plants as air cleaners. You’ll need two plants in 10-12″ pots per 100 sq. ft.
Here’s the list of plants. Pay special attention to the type of VOCs the plant is best at absorbing. So, if you recently bought new carpet, furniture or laminate flooring you may want to consider English Ivy, Boston Ferns, Snake Plants or Spider Plants. Peace Lily’s are perfect for your entertainment area since they will absorb the acetone from the electronics. No green thumb? Too much plant life? Consider the next approach. Air cleaners are a smart option. In fact, you may just end up loving your air cleaner. ~Remove airborne dust, mold and pollen. Can you picture less dust gathering? It’s a nice visual, isn’t it? Think about it. It solves the air freshener problem, doesn’t it? Not all air cleaners/purifiers are created equal. Many are only equipped with a single HEPA filter that can’t handle VOCs and odors. Doesn’t do you much good, right? Find out which air cleaners are worth it. The final way to clean up your indoor air is an unusual one. Yes, drywall exists that absorbs VOCs for 75 years even when painted with up to 25 coats. The drywall captures and converts VOCs into inert compounds and safely stores the compounds within the board. No need to be skeptical because the claims were validated by UL Environment and certified by Greenguard Indoor Air Quality. Both reliable certifications. Check out www.airrenew.com for more information. Unless you are renovating or building new, it may not be practical to redo your entire home, but it could make sense to do the bedrooms and nursery. Ready For Clean Air and Cheerfulness? You’re loaded with ways to do some clean up and start breathing cleaner air. Living with cleaner indoor air means you’ll be healthier and if Joseph Addison is right, more cheery too! Could you do me a favor and share this with your friends? Don’t miss the rest of the series! You’ll learn about all natural/organic pest care, safe paints and cookware, the best non-toxic personal care products and more. Sign up for the full series!. 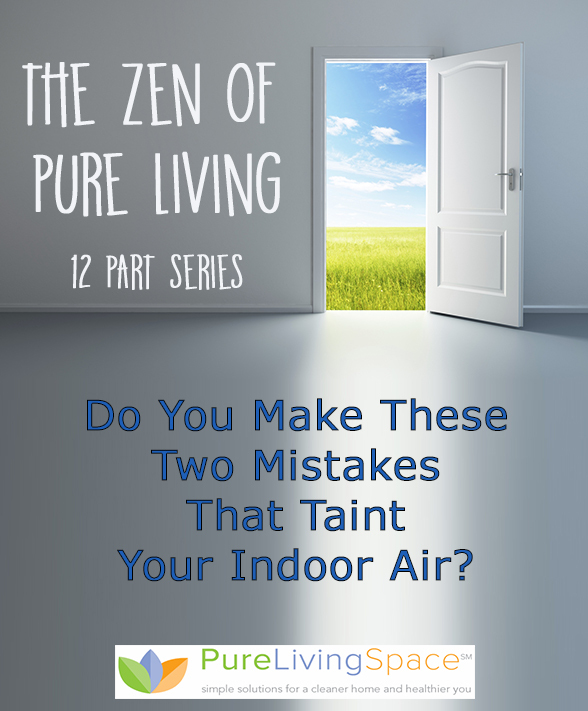 Do You Make These Two Mistakes That Taint Your Indoor Air? Do you believe that outdoor air is dirtier than indoor air? It’s hard to believe – right? You were always taught to be concerned about outdoor air pollution. But, in reality, it’s really the air trapped in your home that is dirtier than outdoor air. First of all, you live indoors with the windows closed with the same air being recirculated by your heating/air conditioning systems trapping all sorts of airborne particles inside. Yes sure, your air filters catch some of the larger particles, but it is really the finer particles and Volatile Organic Compounds (VOCs) that cause health issues. And, your air conditioner/heating filters are no match for these airborne particles. Second, if you’re making the mistake of using air fresheners and the wrong cleaning products, you are adding to poor indoor air quality. Kinda of disturbing, isn’t it? 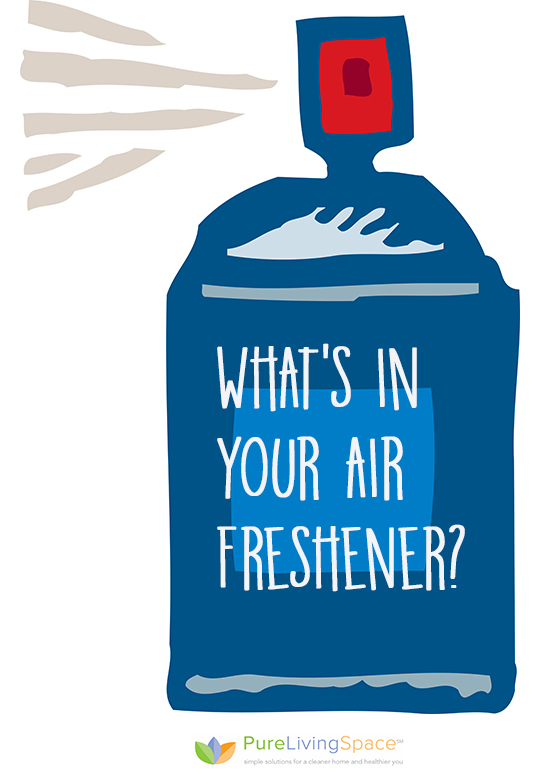 Simply by using air fresheners and cleaning products, you are releasing VOCs that could create health issues for you. Here’s what you need to know about air fresheners. You like your home to smell fresh and clean, so you use spray air fresheners, scented candles and plug-ins. The scents smell great, and you don’t have to worry about your house smelling funny when people stop by. You’ve smelled bad odors in other people’s homes, and you don’t want that happening to you! Unfortunately, while you may love the way your air freshener makes your home smell, you may unknowingly be subjecting yourself to dangerous chemicals. You can read the full article (What’s In Your Air Freshener? ), but the facts are simple. Research shows that air fresheners contain hormone disrupting chemicals and chemicals that are likely or known carcinogens. Sadly, any freshener containing perfume is problematic. So, whether you’re using scented candles, plug-ins, sprays or solids, it’s all the same. So, do a good thing for your health, and stop making the mistake of using air fresheners or use them on a more limited basis. Cleaning products are another source of bad stuff released into your air that you really want to take seriously. 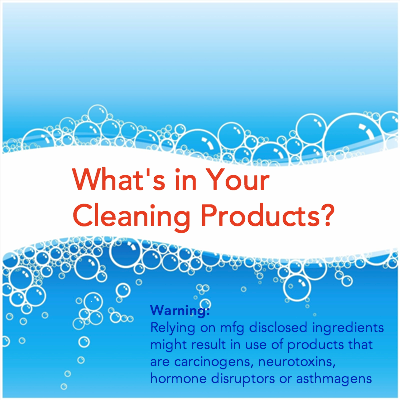 Check out Get The Truth About What’s In Your Cleaning Products for the full story. The Consumer Product Safety Commission has lax regulations for disclosing ingredients so anything labeled as fragrance is largely unregulated and untested. Fragrances can be any one of 3000+ ingredients – many synthetic, petroleum-based and toxic. Think that buying products labeled as Green or All Natural are safer? They aren’t. Green and All Natural are marketing terms that aren’t regulated. You’re a bit dismayed that labels aren’t trustworthy. And, that you are using products with untested, unregulated ingredients. How do you find the safest cleaning products? You can easily find the safest cleaning products though. 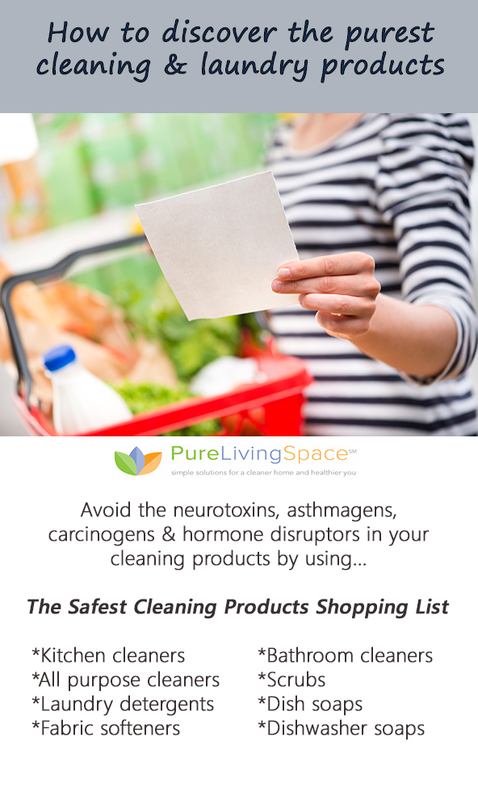 Use the Pure Living Space Shopping List for the Safest Cleaning Products. Click to sign up for a free printable shopping list that is all set for your next grocery run. You’ve got what you need to improve your health today, so what’s stopping you? Unless maybe….you’ve got an evil genius like Mary Todd Lincoln! Don’t miss the rest of the series! You’ll learn some surprising ways to clean up your indoor air and more myths will be debunked. Sign up for weeks 3-12. 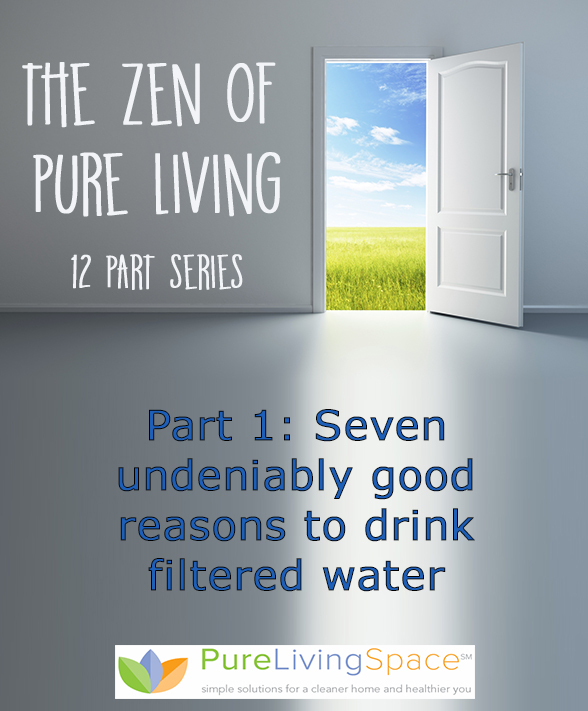 Welcome to Week 1 of The Zen of Pure Living. The first of 12 installments that will help you live healthier and wiser at home. You can rely on this advice because it’s science-based and thoroughly researched. Let’s start with the basics – clean drinking water. Sometimes, you worry about what’s in your drinking water. Some of the stories you read strongly suggest that you should filter your water, but you feel like these stories may be exaggerated. It’s troubling to think that your tap and bottled water may not be safe. Aren’t regulations in place to ensure the cleanest drinking water? The answer may surprise you. You may want to start drinking filtered water. Here are seven good reasons why. Tap water has contaminants from agriculture (pesticides, fertilizers), industrial pollutants, urban runoff chemicals (car emissions, road surfaces, pharmaceuticals, personal care products, flame retardants), and water treatment chemicals (disinfectant byproducts like trihalomethanes & haloacetic acids). It’s an overwhelming list, isn’t it? Especially since many of these contaminants have been linked to cancer and liver, kidney and nervous system problems. So what’s the problem? New chemicals are being constantly developed, so the list of contaminants for the EPA to regulate continues to grow. To see what type of problem this creates, think of what happens in an overcrowded classroom. Say you’ve got an outstanding third grade teacher who starts the year with a class of 20 students. During the year, the principal sends a new student to his class every week. How well do you think that teacher is doing by midterm when the class goes over 35? How about spring break when the class is over 45? Probably not very well. In fact, you can imagine that this outstanding teacher is struggling terribly with a class that is too large and bursting at the seams. The same situation applies to the EPA and water contaminants. Lots of contaminants, new contaminants piling up on the list and not enough time or resources for studies and regulations. You’re probably not sure what this means. 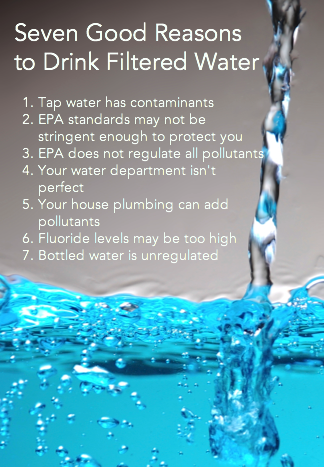 Did you know that the EPA sets two levels for water departments? You may be wondering how this works. The EPA sets two contaminant measures-one standard is enforceable while the other is not. The unenforceable standard is called the Maximum Contaminant Level Goal (MCLG). The MCLG is set at a level where no adverse health effects are expected. As a result, your tap water may have unhealthy levels of contaminants (exceeding MCLG) but still be meeting the enforceable standards (meeting MCL). Your water is not as clean as the EPA experts think it should be for good health because the EPA also factored in the cost of meeting those safety levels. To get an understanding of how this works, consider arsenic standards. The EPA classifies arsenic as a known human carcinogen. Its MCLG is 0.00 meaning that to avoid the possibility of adverse health effects, water should not contain any arsenic. However, arsenic’s MCL or enforceable level is 0.01 which allows water supplies to contain arsenic and meet standards. The EPA does not regulate all pollutants. In fact, in a 2009 study a total of 316 contaminants were detected and 202 of those contaminants had no safety standards. And, the study showed approximately 132 million people in the US had unregulated pollutants in their tap water. Admit it. You’d much rather have safety standards for more contaminants. In the 2009 study, only 1/3 had safety levels. Does that seem like enough to you? Your water department may be failing on certain regulatory standards. People make mistakes. Processes fail. Equipment malfunctions. When these mistakes happen, they can affect a large number of people. For example, during 2004-2009, EWG reports that water departments serving 53 million people failed to meet the MCL for TTHMS or Trihalomethanes a “likely carcinogen” according to the EPA. Your house plumbing may be contributing to contaminants because water pipes can add significant pollutants to your water. So, as your tap water travels from your water treatment plant into your house, it could be picking up contaminants along with way. Tap water contains fluoride which can cause adverse health effects. A 2006 study of Fluoride in Drinking Water sponsored by the EPA recommended lowering the MCLG due to concerns about increased bone fracture rates and enamel fluorosis in children 0-8 years old. The committee also recommended further study about fluoride’s impact on endocrine (thyroid) and brain functioning. The MCL and MCLG currently remain at 4 mg/L, an unsafe level according to the committee. For a full copy of the report, click here. A huge study conducted by many experts from around the country says that the fluoride goal is too high nine years ago, and the goal hasn’t been reset. You may think that bottled water is a great solution since you believe it’s clean and pure. Bottled water is marketed as being pure, but how do you know? The answer is…you don’t know. Why? Because the bottled water industry is unregulated. No one is regulating or testing what goes into your bottled water. And then there’s the problem with plastic waste as well as plastics leaching into your bottled water which makes bottled water even less attractive. To get the cleanest water, use a water filter. You can easily install some solutions without a plumber. Do you need help finding the best water filters? Learn more about water filters and solutions and which water filter solution is right for you. Want to fast track this? You can find the right water filter type and brand using The Minimalist Guide to Water Filters for unbiased, performance-based recommendations. Now, you’re armed with the facts about your drinking water, and you know that finding the right solution is pretty easy. Don’t miss the rest of the series! You’ll find out that indoor air is really dirtier than outdoor air and other myths will be debunked. Sign up for weeks 2-12. You’re clenching your teeth hard but you don’t even realize it until it’s too late and your jaw is aching and you’ve got a headache. Your life is out of control. You can’t keep up and you can’t see a way out. Bad things are going to happen—you just know it. You’re jumpy, irritable and short fused. It’s no wonder you can’t sleep at night. All you can think about is being miserable and all the work that’s piled up and the problems at home that aren’t going away. You wish you could shake off the unsteady feeling and the sense of doom. The racing heart isn’t helping you. Your friends and family seem to be getting tired of listening to your complaints and talking you off the ledge. You can still remember when you weren’t so stressed and wonder how to stop feeling this way. 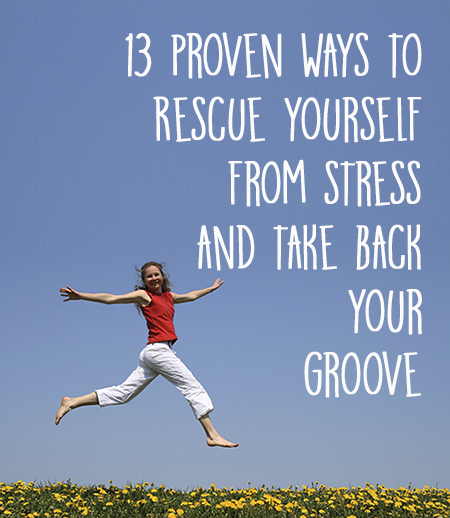 Try these 13 tips designed to end stress and restore your groove. It will take only 10 minutes of your time. Turn on some rhythmic music. Begin by shaking your whole body from your feet, through your knees, hips and shoulders and to your chest. Shake strongly. Let your shoulders relax, your jaw hang open and your head go. Do this for 5 minutes. You’ll feel silly but don’t stop or slow down. Then stop. Pay attention to your breathing and body. Take deep belly breaths for 1-2 minutes. Next, turn up the music for dancing. Dance freely for 3-5 minutes. Try to select an upbeat song. Finally, relax for a few minutes at the end. Be honest. You’re not sure about this one. But, shaking and dancing will fix your stress problem! To read more about this, check out “Unstuck-Your Guide to the Seven Stage Journey Out of Depression” by James S. Gordon, MD. You’ll be glad you did. You’ll like this easy one. It’s a great stress rescue and takes only a minute. You can try it right now. Extend your arms over your head in the shape of a V and form V’s with your fingers. Sense the change in your body (all sorts of good physiological things are happening to you right now!). You feel better already, right? You can use this as a rescue when your boss says something unpleasant or you’ve burned dinner, again, or you’re late and stuck in traffic. It works. This one is great if you’re stuck in a thought and can’t seem to get out of the “do loop”. Pick up a pad and a pen and begin to journal with your non-dominant hand. Yes, it’s hard but don’t worry about whether it’s legible. The purpose is to write about what comes to mind not worrying too much about the topic or flow. Using your non-dominant hand means that you’re tapping into a different part of your brain. You’ll be surprised at what comes up for you. And, when it’s complete, you’ll feel better. This one may seem a bit weird, but if you’re feeling stressed AND angry, it’s for you. Google baby animal pictures and take a look. Try baby giraffes, koalas, bears, monkeys and goats. Puppies and kittens are also effective. It’s impossible to feel stressed and angry when you are feeling compassion and love. It’s that simple. You probably know that laughing is a good stress reducer, but you don’t have anything to laugh about. Or do you? Try Laughter Yoga. Yes, it’s a real thing. Google it and give it a try. Laughter Yoga is a practice involving prolonged voluntary laughter. Even though it’s voluntary, you still benefit from the same physiological and psychological benefits as spontaneous laughter. You may even start laughing spontaneously when you watch the videos of people practicing this form of yoga. So, you don’t have anything to lose, right? You’ve probably practiced this one before without knowing it. Singing at the top of your lungs is great for reducing stress. It helps reset your nervous system. Your car or shower are great places to belt it out. See if you feel more relaxed afterward. Occasionally, you need a gentle reminder to relax which is what Rule Number 6 is all about. Rule Number 6 is simple. And, what about Rules 1-5? There are no other rules. You may want to place some post-it notes on your computer monitor or your mirror. It helps. You’ve probably read lots of ways to reduce stress by breathing. Have you tried alternate nostril breathing? Didn’t think so. While sitting comfortably, place the tip of the index finger and middle finger of your right hand in between the eyebrows, the ring finger and little finger on the left nostril and the thumb on the right nostril. You will use the ring finger and little finger to open or close the left nostril and thumb for the right nostril. You’ve just completed the hardest part. The rest is easy. Now press your thumb down on the right nostril and breathe out gently through the left nostril. Now breathe in from the left nostril and then press the left nostril gently with the ring finger and little finger. So, basically, you’re breathing in from one nostril and out through the other. After every exhale, breathe in from the same nostril. Use slow, smooth breaths without force or effort. There are some good videos online if you need help. Complete 9 rounds. You’ll notice a difference. You know how much better you feel when you’ve been in nature. You can use this when you’re feeling stressed. It’s simple. Step outside and find three things you’ve never noticed before. You may notice how delicate the leaves are on a plant or you may hear the chatter of the squirrels. Simply noticing will have a magical effect. After a while, you’ll also notice that you’ve broken the spell you’ve been under, which is a good thing. This one is a real winner when your stress is caused by frustration with others. You simply remind yourself that “everyone is doing the best that they can with their current level of awareness, skills and knowledge”. It creates more compassionate thoughts about others, so you can relax. If you think about it, awareness, skills and knowledge covers just about everything, so you’ll be hard pressed to find a situation where this doesn’t apply. So, if you are feeling stressed because someone is working against you, then remember that they lack awareness and are doing their best with the awareness that they have. If they had better awareness, then they wouldn’t be thwarting your efforts, right? And, try strategically placed post-it notes with the acronym ASK (awareness, skills, knowledge) as a reminder. Sometimes the best thing to do when you’re stressed is to plug-in your ear buds and listen to some tunes. For something new and different, try Chakra Chants by Jonathan Goldman. It won an award for the Best Healing-Meditation Album and you’ll see why. You cannot be stressed while listening to this music. If you’re anxious about a meeting or confrontation, try visualizing yourself surrounded by a protective covering. It could be an egg protecting you or a bright soothing light that is impenetrable. Whatever works best for you. Can you picture yourself handling that difficult situation better now? After all, you’re nicely protected. This last one is your key to your future well-being. You can read more about this in Dr. Amen’s book called Magnificent Mind at Any Age. In his book, Dr. Amen describes ANTS or automatic negative thoughts. You and everybody you know has negative thoughts. The problem occurs when you have too many, unrelenting negative thoughts. These thoughts can rob you of your joy in life. You’ve noticed that these ANTS tend to multiple, right? It’s okay because you can get rid of them with just a bit of work and the right tools. When you feel nervous, sad, or mad, write out the automatic negative thoughts in your mind. Evaluate whether or not they are true. If they are not true (and so often they aren’t), then talk back to them. You do not have to believe or accept every thought you have. You’re probably thinking that you cannot stop all the thoughts, which is true, but think about this quote. So how do you meet your thoughts with understanding? Pick up a pen, piece of paper and start talking back. And, by doing so, you will reclaim your thoughts and your life…and get your groove back. Can We Continue To See Each Other? Please excuse this outbreak, but can we stay in touch? We will send you only the best content. Get The Safest Cleaning Product Shopping List. You buy cleaning products labeled as “green” or “all natural” because you feel confident that these products are safer for you and the environment. You also closely read the ingredients trying to avoid the nastier stuff. Unfortunately, neither approach works. Why? Because claims of “green” or “all natural” are simply unregulated marketing terms and because the ingredients are not required to be fully disclosed on the label. Regulations allow manufacturers a great deal of leeway on the ingredient list; they can list all, none or some of the ingredients.It’s a troubling thought that the ingredients listed are incomplete, isn’t it? For fragrance formulations, if the manufacturer chooses to disclose fragrance as an ingredient, the general term “fragrance” can be used rather than listing the specific chemicals. You may think that purchasing unscented products means a safer product. Unfortunately, many unscented products have fragrances to make the product smell unscented. Fragrances can be any one of 3000+ ingredients – many synthetic, petroleum-based and toxic.Kinda frustrating, right? You go to the trouble of finding an unscented product, but it might still have a scent? If the manufacturer deems the ingredient to be non-hazardous, then the ingredient does NOT need to be reported on an MSDS. Some of the ingredients may be listed in general terms like “cleaning agents” or “softeners”, so you have no way of knowing what’s in it.Admit it. You’d like better disclosure, so you know what you’re using, right? 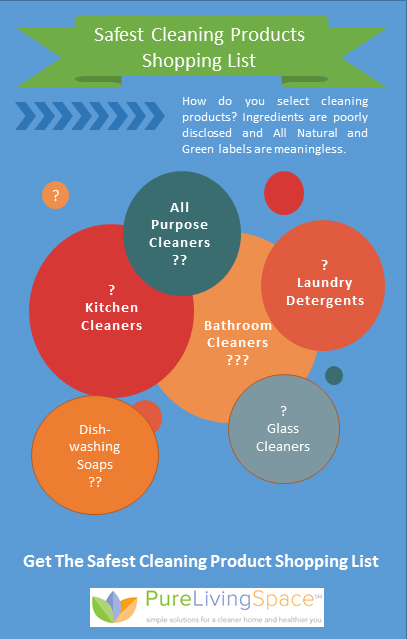 So the truth is, for the most part you simply don’t know what’s in your cleaning products. So what should you do? If you truly want the safest, non-toxic cleaning products, you should make them yourself. Vinegar, salt, baking soda, lemon and tea tree oil in the right formulas can work amazingly well. If you are recoiling at the notion of creating your own, you have other options. Get The Safest Cleaning Product Shopping List. You’ll love it. Pure Living Space compiled the safest cleaning products including all purpose, dishwashing, laundry, bathroom and kitchen cleaners. Simply print and take it with you shopping for the easiest way to find the right products. Whole Foods has created an Eco-Scale rating system that requires all cleaning product ingredients be disclosed except proprietary fragrance and enzymes. This helps but still falls short of full disclosure. The Green and Yellow ratings mean that the product has no ingredients with “moderate” environmental or safety concerns. The ratings are supported by third party testing which is a good thing. All products from Green Mission™ and GreenShield Organics have Green ratings while Earth Friendly Products, Ecover, Seventh Generation and Whole Foods Market Brand have a combination of Orange, Yellow and Green ratings so look for the Green and Yellow rated products. Clearly, if you can make your own, it’s better for you but these are good alternatives. Perhaps starting with one home-created cleaning product would be a good way to ease into it. You could start by using vinegar and water (equal parts) to clean shower mildew or counter tops (except marble). Then, move on to a great tile and grout cleaner. The ingredients are below. Tape the ingredients to the bottle so when it’s time to replenish, you don’t have to look up the recipe again. I help people create safe and healthy homes (pure living spaces) with simple tips, science-based advice and a bit of humor kicked in. It shouldn't be hard to live well.